At the Marine Life Center, over 70,000 visitors - mostly school children and parents - are introduced to local marine flora and fauna in aquatic displays and a hands-on touch tank. 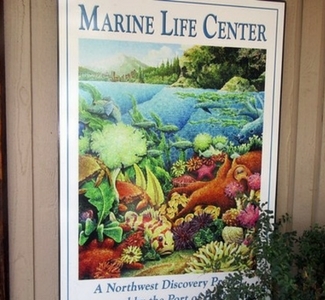 The main goal of this non-profit, originally formed under the Northwest Discovery Project, is to raise marine awareness. To promote stewardship of Washington marine life through interaction. Visitors are introduced to the creatures in the Salish Sea and inspired to appreciate the marine animals that are at home in these waters. The MLC offers a variety of exhibits such as, an Observation Pool, Touch Pool, Octopus Tank, Bubble Tank, Rocky Shore Habitat and an Algae Tank. Some the creature you'll find are, a Giant Pacific Octopus, Anemone's, Barnacle's, Dungeness Crab, Sea Cucumbers and so much more!